Why do knitters love socks? Socks are portable, useful, fairly quick to knit, and universally wearable. 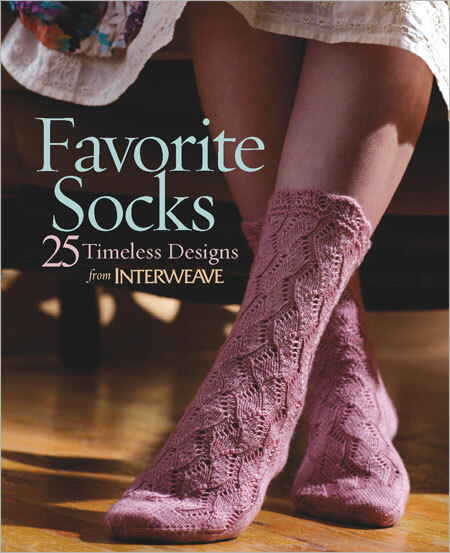 In Favorite Socks, Interweave offers 25 beautiful and timeless sock patterns for every occasion in a range of techniques, traditions, and designs. Many of these patterns have become unavailable as original issues of Interweave Knits went out-of-print, now they are handily bound together in this inspired collection. The adventurous knitter will find a classic, varied compilation of socks from renowned sock designers including Nancy Bush, Evelyn Clark, Priscilla Gibson-Roberts, and more. Highlights include a tutorial for knitting socks on two circular needles and instructions for making resoleable socks. You’ll even find 6 brand-new “classics” designed by Ann Budd for those avid knitters who may have every issue of Knits since 1996.